After over 4,000 swings of testing performance baseball bats we have decided on the bat most power hitters should choose. In BBCOR, we love Marucci’s CAT 7 Connect; USA Bat then we pick the Easton Beast X Hybrid; USSSA Big Barrel we would pick up the drop 5 CF Zen. If you do NOT struggle for bat speed, then keep on reading. The drop 5 version of the 2019 CF Zen felt the best in our hitters hands, absolutely smoked baseballs and gets the best wide range of user ratings. If you do not struggle for bat speed, and play in a USSSA baseball speed, you will be a better hitter with this bat. One of our favorite BBCOR bat hits the Marucci CAT 7 Connect has a perfect end load with the seriously big hitting High School and collegiate player in mind. Although this bat should be categorized as a drop 8 instead of a drop 10 it absolutely rakes. We rate it as the best overall USA Bat too. If you would rather search the used market fora big hitting BBCOR bat then we suggest the 2017 Easton Z-Core XL. This is a big hitting monster of a bat. Single piece and a good price are hard to pass up for the home run king. In terms of sizing for power hitters, we think the bigger the better. You can use our bat size chart to get you started. But, if you find yourself not at the heaviest/longest version of the bat you are interested in and are a true power hitter, size up an inch or two. Why the CAT 7 Connect for a BBCOR Power Hitter? 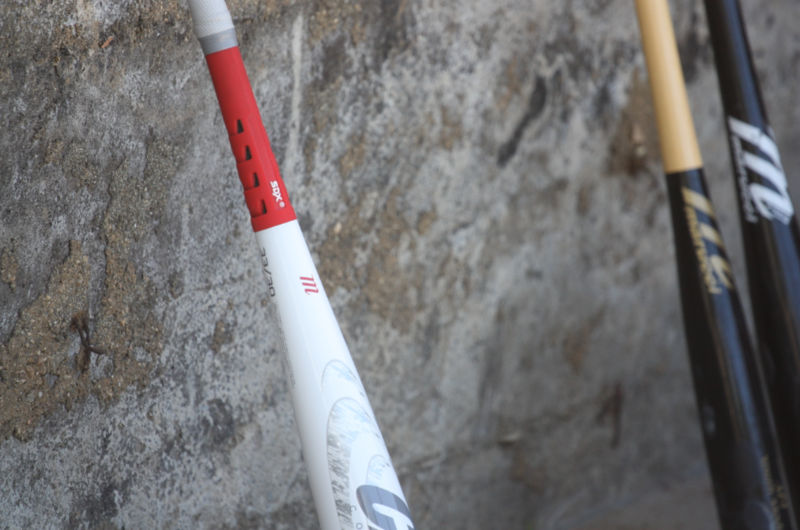 We are in love with the Marucci CAT 7. And the CAT 8 looks promising too. But the CAT 7 connect is made specifically for big time hitters. It uses the same sweet singing barrel but also adds some weight in the end cap to make it a true end loaded swing. The two piece design feels fantastic. Customer reviews on the bats have been nothing short of fantastic across the board. In fact, after scouring the interments, we can’t find a single bad review on the bat. As well, the swing weight of the BBCOR CAT 7, although not considered end loaded, is not as light as the two piece composite “balanced” bats in the BBCOR space. It runs about 5% heavier than the lightest swinging BBCOR bats. A heavier swing is what power hitters want. See our full Marucci CAT 7 Connect Review. Why the CF Zen Drop 5 for the Best USSSA Power Hitters Bat? Although still early in the 2018 season, DeMarini released the CF Zen for 2019 due to some foreseeable banning problems with the 2018 version. The drop 5 version of the CF Zen in 2019 is an absolute bomb maker. Hitter’s loved the feel on hits and mishits, the end loaded balance of the stick and the very large barrel. Why the Easton Beast X Hybrid USA BAt for the Best USA Power Hitters Bat? We consider the Easton Beast X Hybrid the best USA Bat on the market today. After hitting with it among several different players, measuring its exit speed and barrel size as well as reading online reviews we can’t get enough of this bat. However, the only draw back (aside from the price) is the bat’s swing weight. It simply swings very heavy for a drop 10 and, we think, should be considered a drop 8 bat. That said, if you can swing it then you should be swinging it in USA baseball. See our full 2019 Easton Beast X Hybrid Review. Some weeks ago, we wrote an article called the Best Bat For Home Runs. It differs in results with this article whose focus is more for the power hitter’s among us. But, no doubt, the two are very similar and both this Voodoo One and the Axe Avenge are big hitter’s dreams. If you would rather search the used market fora big hitting BBCOR bat then we suggest the 2017 Easton Z-Core XL. This is a big hitting monster of a bat. Single piece and a good price are hard to pass up for the home run king. This bat is available only in BBCOR. Those in the USSSA bat space should find an old XL1 from Easton. As we state in every best bat article we write, we make no over the top statements that the best bat on this list is the best bat for everyone. Indeed, we don’t even argue the bats above are the best power hitter’s bat for those in the power hitter’s space. Rather, our experience is that we, and many others, like these bats a lot in their defined space. There are at least a few other used/older bats worth considering too. Easton’s Z-Core XL is likely the most similar bat to the Voodoo One. It is also a single piece aluminum bat with an endload. The XL’s barrel is physically larger than the Voodoo One. It serves the same purpose as the Voodoo one and is a great fit for players in the Aluminum Log space. So, why not the top Spot? Simply because it does not come in a drop 10 Big Barrel like the Voodoo One. Price check the Z-Core XL. See our full Easton Z-Core XL Review. Next: Next post: Best Composite Wood Bat | Baum, CornDogs or the L180?